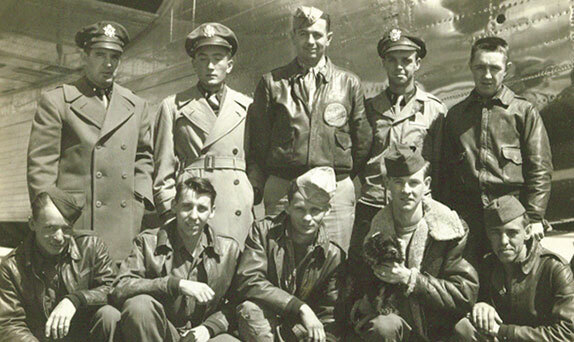 The Jaques Crew was one of the original crews for the 492nd BG that trained in Alamogordo, New Mexico. They transferred in as crew 1661 from the 330th CCTS (Combat Crew Training School) in Biggs, Texas, on 3 Mar 44. They were assigned to the 859th BS, designated as Crew 909. Capt Louis Jaques Jr signed out for a B-24J, 44-40069. To our knowledge they didn't give their plane a nickname. In April 1944, they flew their assigned aircraft to North Pickenham, England, via the southern route. Their Squadron Operations Officer, Lt Taylor, flew with them, thus bumping Sgt Abbey onto the Queen Elizabeth. Jaques flew as the aircraft commander for Crew 909 for one mission. Afterwards, he was promoted to serve in the command staff. The Crew became the Group's pool for replacements and substitutes. Carl Brown and Ralph Alexander had been assigned to fill in for a couple of sick men on the Brantley Crew 905. The mission was scrubbed and rescheduled for the following day. In the meantime their passes to London had come through. Two men from the Haar Crew 912 ended up flying with Brantly instead. You could say that they were substitutes for the substitutes. When Brown and Alexander returned from London they learned that the Brantley ship had not come back. They were assigned to fill the vacated positions on the Haar crew. It wasn't until after the war that they learned that the two men they had replaced had been killed. Hawkley was reassigned to Jacks Crew 918 and became a POW when they were shot down on 7 Jul 44. Capt Jaques was also captured on the same day while performing his duty as an Air Leader flying with Harding Crew 902. We're still working on finding the fate of the other men. Chaffee was briefly put into the orphans pool until the O'Sullivan Crew lost their navigator on 29 May mission to Politz. By this time his new crew had already flown seven missions to his one. So when the O'Sullivan Crew finished their tour, he was still six short. He was reassigned to the Haag Crew 706 when they were transferred to the 44th BG on 10 August 1944 and completed his tour with them.